In lieu of being able to afford to eat at Thomas Keller’s French Laundry, Per Se and Bouchon, I will gladly settle for Bouchon Bakery. On the 3rd floor of the Time Warner Building, right above Per Se, sits Bouchon Bakery. 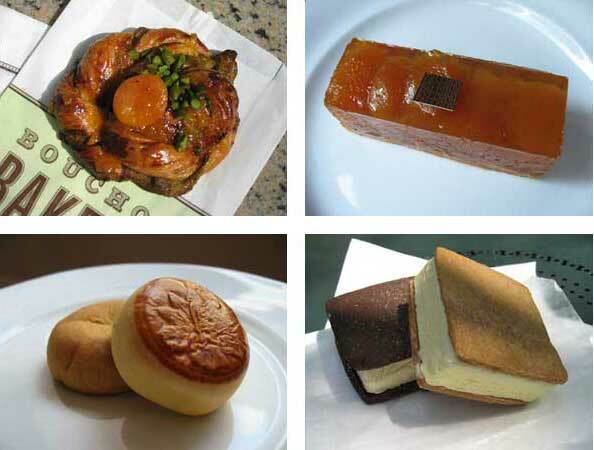 There, Pastry chef Sébastien Rouxel of Per Se offers an assortment of lovely and affordable treats. During our breakfast visit, we sampled a seasonal Danish, a pain au raisin, and a chocolate TKO cookie. The seasonal Danish was filled and topped with roasted pistachios, which were fantastic, and additionally topped with apricot. The pain au raisin was made of plump green and red raisins twisted into light, buttery and tasty Danish dough. My companion claimed it was the best he’d ever had. The TKO cookie consisted of two chocolate cookies sandwiching a lovely butter-cream. Thomas Keller proves that he can also do casual pâtisserie very well. Two thumbs up for Bouchon Bakery. As one enters Fauchon, it is hard not to be affected by the décor. Fauchon’s signature white, pink and black colours demand attention. I am told that Fauchon Paris in New York is a modest version of their flagship store in Paris. With a beautiful display of pastries, chocolates, cookies, jams and confections, Fauchon is a wonderful specialty store. While I was in Fauchon, I saw Susan Sarandon buying jams and chocolates as small gifts for friends. The clientele varies, but the store feels a bit chi chi. The items here are definitely pricier than the average chocolatier or pâtisserie, but is it worth it? In my opinion, yes. I sampled the apple tart, which consisted of a thin layer of pastry topped with thick chunks of caramelized apples held together by a surprisingly pleasant apple glaze. The pastry chef Florian Bellanger has designed a wonderful tart—absolutely delicious! I also bought a number of other yummy confections, chocolates, caramels and red fruit candies. Fauchon is a fancy shop, but one I adore. I can’t wait to visit their flagship in Paris. This elegant shop sells some of the finest Japanese confections, known as wagashi, in New York City. Minamoto Kitchoan has stores in other cities, such as London, Paris, Singapore, Taipei, and Hong Kong, as well as shops in southern California and Japan. From red bean sandwiched pancakes, through mochi and dango (which are different forms of rice cakes), to jellies, sponge cakes and cookies, Minamoto’s pastries and confections are small, cute and beautifully packaged. With an interesting range of flavours not commonly found in Western bakeshops, Minamoto serves up some cool and creative sweets. I tried three confections. The first was a plum suspended in plum wine jelly garnished with gold leaf. Second, I had a cake that was filled with red bean paste. Third was Hakuunno-Hotori, a pastry filled with white bean paste. The confections here are unusual, inspiring and beautifully made and packaged. Pass by if you have never experienced wagashi and if you love Japanese design. Well-known chef Tom Collichio of Gramercy Tavern and Craft has opened Wichcraft, a takeout chain that serves fresh and tasty gourmet sandwiches. This chain has become very popular, with new shops popping up around New York and a few scattered across the U.S. Wichcraft serves up sandwiches at price of about US$9. It also sells soups, salads, coffees, pastries and ice creams. Although somewhat steep in price, the food is made with quality ingredients. We sampled two sandwiches: the first included goat cheese, avocado, celery, watercress and walnut pesto on multigrain bread, and the second was a grilled greyer sandwich with caramelized onions on rye. I recommend trying their ice cream sandwiches, which cost US$3.50. The two on the menu the day we went were homemade graham crackers with cinnamon ice cream and chocolate cookies with banana ice cream. Although slow during the busy lunch rush when we were there, Wichcraft’s fare was tasty, fresh and higher quality than most fast food. Posted by Sam at 8:06 p.m.
Bouchon Bakery is on the third floor and per se is on the fourth, so it would be under, were it not on the other side of the building.